I must admit, when researching the game in the past, when it is a paper I know well, for example the Falkirk Herald I often skip most of the paper, I read the sports columns, and I read the local news. I know I should read every line of both the Saturday and Wednesday Editions [as it used to be], but that takes so much time, and it makes your eyes hurt, and it makes you never want to read another paper for the rest of your life. This gets me through seasons much more rapidly, but it means I miss a lot of little things, it also means I can not take in the game in the wider context of society, if I had more time/patience I would do so. But every so often something just catches my eye, a name I recognise, or something and I get an insight into the world of football in Falkirk beyond twenty two men chasing the leather. 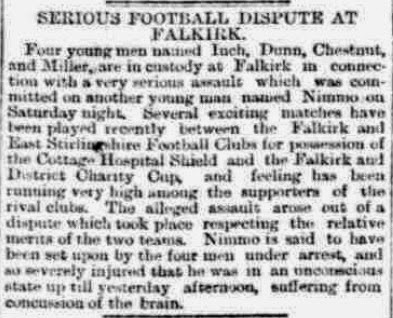 Towards the end of the 1889/90 season Falkirk & East Stirlingshire were as ever in contention for the local cups on offer, and this season the two clubs were again having one of their on-off lover's tiffs and refusing to play each other in friendly matches [even though the match was always a big draw]. The first meeting of the two teams that season was to be the final of the Falkirk Cottage Hospital Shield held, as usual, at Camelon's Victoria Pk. East Stirlingshire won 5-3 and that is all I had in my notes. Then a couple of years on looking for something else completely I just noticed a little article in the papers not in the Sports column but surrounding the game, well more the aftermath of the game. It seems that at least some of the 'Shire lads went out that night to celebrate their victory. 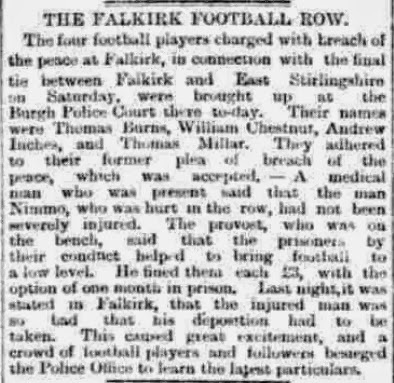 There is very little of concrete to go on, it would seem [to my biased eyes] that in their revelry four "shireites" [at least two of them [Thomas Dunn & Andrew inches] seem to have been ESFC players] having lost an argument on the relative merits of the two teams with a single Falkirk fan decided to beat the crap out of him. What else do you expect from Bainsford? All in all I think we should just learn the lesson not to be around the same pub the next time ESFC win something, just to make sure.